In education there are five types of teachers when it comes to technology use in their classrooms…in my humble opinion. Oblivious – IWB? Twitter? What does that mean? These are teachers that don’t know what they don’t know. Technology is not something they use nor do they seek to learn about it. 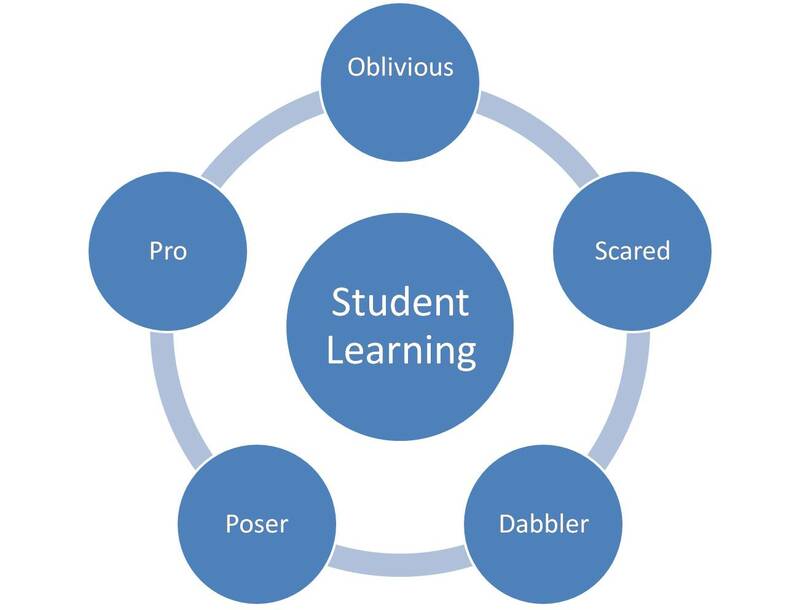 Fearful – The fearful teachers know of the tools out there but are too afraid to try them. They have heard of the newest tools and might have a few in their classrooms. However, they are neither comfortable nor confident in their own skills. Typically, these teachers want to use more technology in class but lack the direction and confidence to get started. Dabbler – The “dabbler” has a few technology tools and resources they use. Usually, they will have a few favorite websites or activities they will default back to. These teachers are willing to try something new but will revert back to their favorites which are often the first resources they ever used. Poser – Teachers in this category use a long list of technology resources and tools. However, they are just using the technology to use it. Their students are not actually extending learning or deepening comprehension. They are like the golfers the show up with $1000 golf clubs and hack it up and shoot a 130. Another characteristic of this type of teacher are elaborate projects with very little substance. They think that if a kid is on a laptop or if the IWB is turned on, they are “using” technology to help kids. Pro – Pro users have a wide array of tools at their disposal similar to the poser. These teachers, however, use the tools to make learning more rich for their students. They are not using the technology because they can; they are using it to make learning better for their students. The key to being a pro is realizing that you don’t need the technology in order to help kids learn but you realize the power it has to make learning better. I would argue that all of these types of teachers have their pluses and minuses. The key is to first identify which one you are and reflect on what you are doing to help students learn. Students will learn from each of these teachers, but I would hope we all aim to be a pro or at least a dabbler at some point. Just as a doctor’s work changes with new tools and technologies, so too must a teachers. Regardless of what type of teacher you are, you must remember that student learning must be the center of all that you do. What kind of teacher are you? What kind of teacher do you want to be? Josh, you fail to mention that a lot of teachers are the same "type" that their administration is. I feel like I'm a bit more poser/pro than most at my school because technology is my passion, and therefore I make time for it outside the variety of my other expectations. But I can't expect all my coworkers to do the same. I can spend more time and energy to bring tech issues with with other staff and admin, but that takes away from the time and energy I have to help my students. Also, I'm still very much in my "beta" mode, and I fear that if I don't do a fair amount of research and support before with share it with others, than there won't be as much buy in. It's a very difficult balance. You could make a graphic that conflates these with the learning curve for tech. Personally, my initial experience with any tech starts in the "poser" realm, but ends nearer the pro. The best way to help teachers move to the ranking of pro is SUPPORT. Professional development, casual learning sessions, lots of one on one help and hand holding can turn the most fearful, dabbling, poser among us into a pro. There will always be early adopters, but with support from admin everyone can increase their skills and their comfort level.